Any plans on making more Hallstatt daggers / knives etc? Have you made any other weapons in the past? I'm sure someone like Nathan Bell will be interested in your replica. Nathan? Here's a nice colour pic of a Hallstatt knife (I posted a B & W pic of it on the first page). Enjoy. Visit www.archaeoreplik.de - there´s stuff made by myself from stone age to early iron age.. I love this site and this is the type of thread that really excites me. Here I post a possible Hallstatt dagger for your comments and opinions. "a rare and ancient sword named Hrunting. Any infos about dates and where it was found? Posted: Fri 06 Oct, 2006 8:40 pm Post subject: Hallstatt dagger? I bought this from a dealer who got it from a detectorist in Germany. Where exactly it was found in Germany I do not know. When these objects are removed from the location where they were found they obviously loose their context which is frustrating. 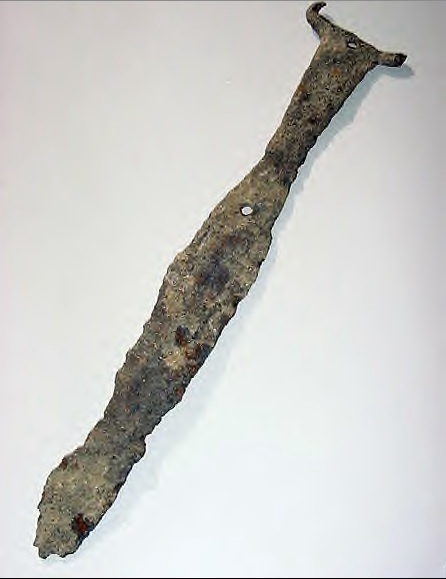 I see this weapon as coming from a transitional phase between the Hallstatt and La Tene periods. The tang is long. From the blade the tang narrows and then broadens in almost an hour glass shape (this shape of the tang I believe is reminiscent of some Hallstatt weapons) until it terminates with the horn like projections on each side similar to the longer projections seen in Hallstatt daggers. At least that is what I see. My wife claims my iron sicas and Naue II swords look like rust lawn mower blades so beauty truly is in the eye of the beholder. I apologize that the image I provided is so big. The item is approximately 10 inches. Please excuse as this was my first post here. Detectiorist are in my opinion "acheological terrorists", only a very little number works correct and report the finds to the covernment, the rest - a huge group - dig and sell the finds at ebay. Your dagger don´t look hallstatt or latène, sorry! The shape of the tang, the pommel, the horns,....that´s not the common style of both periods. Looks like some middle age "Bauernwaffe" (note the shape of the tang, like an german "Messer"). I guess, it isn´t celtic! Detectiorist are in my opinion "acheological terrorists", only a very little number works correct and report the finds to the covernment, the rest - a huge group - dig and sell the finds at ebay. Bastards! While I have sympathy for your feelings on this matter, the use of strong language and epithets is not appropriate on this forum. Well, I can't say a blame you feeling that way about detectorists. I remember when I lived in Socking, a town near Starnberg, a thief made a muck of things at a newly discovered archeological site a few towns away. However I was under the impression that the German government gave licenses to responsible detectorists when a public works project, such as a highway, was being constructed. From the time I lived in Germany, long before eBay, I remember metal detecting as being a popular family hobby. Also I am not aware of there being a 'treasure act ' in force in Germany of the kind that the English have. If I am wrong about this point please let me know. One trys to deal with responsible dealers but the bottom line is one never knows where many of these things come from unless the provenance is thoroughly documented. Look for example at what is going on in Bulgaria- that is a sad state of affairs indeed. I certainly do not want to see archeological sites desecrated. I thought I would contribute this image to the mix as the conversation so far it has not only covered Celtic knives and daggers but pre-Celtic as well. I especially liked the diagram someone included in a prior post concerning the evolution of daggers, knives and short swords of the culture-so in the spirit of that post I have included this piece. This is an Urnfield dagger (A vollgriff dagger if you will) I purchased from Hermann Historica a few years ago. It is approximately 9 and 3/4 inches. Thanks so much for taking the time to post this beauty! I would love to see some other shots to get an idea of what it looks like from he side and top. Also could you post data such as blade length, blade thickness, distal taper and weight... I know that is asking alot but it is very rare that someone actually owns one of these artifacts. That looks like the "customized" rest of an hard used "Vollgriffschwert" in an dagger. "Vollgriff"-dagger was very very very uncommon!!! But in fact some sword end as dagger! A sharped-down or broken and refurbished sword - note the chape! I thought that might be a possibility when I saw it in the catalogue but when I finally got it and was able to examine it at home one can see the pair of very fine grooves on each side follow the edge of the blade and are not cut in the blade but are cast. I will see if I can get some close ups posted in he next few days. The cross section is somewhat akin to "hollow ground"
The blade is thin, thinner than I have seen on any of my bronze age swords, and very slightly bowed. I will have to go to my lab for a micrometer and a scale for actual blade width as well as weight. the pair of very fine grooves on each side follow the edge of the blade and are not cut in the blade but are cast. Where´s the problem to re-hilt a broken sword point? I´ve never said, which half of the blade was refurbished! Well true enough except for the fact that the blade is so thin. I will send some more photos when I can and let you decide. Go to the bottom of the following page, there's a link to an article in Italian about these knives. Can anyone translate? Once you click into an individual photo then click on "Download watermarked file for layout" to download a high quality picture.